This was a successful meet enjoyed by all who attended, despite some initially poor weather and a relatively small turn-out. Saturday was a frustrating day of rain-aborted climbing in Langdale and a disconsolate potter to the Aira Force waterfall, as the weather turned annoyingly sunny. Thankfully the promise of good weather came good for the rest of the weekend. Friday saw the long-traditional visit to the Brown Slabs area of Shepherd’s Crag and its excellent selection of good easy routes. New member Ewan Ritchie was shown the ropes with aplomb by Malcolm Brentford, while Chris Manasseh and Yvonne Parr tackled the VS round the corner. As is usual at Brown Slabs we picked our way through the top-ropes and soaked up the relaxed atmosphere of a laid-back crag on a sunny day. My personal highlight was watching a Red Squirrel solo Brown Slabs Crack (VS 4c) in roughly 10 seconds, before forging a new route through the vegetated rock above. Said Squirrel demonstrating technique for Chris M.
Assuming the first ascender chooses not to speak up, I’m naming it The Nutkin Extension (HXS 5b). Climbing on Bank Holiday Monday always feels like a bonus, and this one was no exception. The group spent a long sun-drenched day at Glaciated Slab in Coombe Gill, that quiet and beautiful hanging valley tucked away at the top of Borrowdale. The day was all about sharing skills, friendly banter and loving the rough volcanic rock. The slab is great value for its size, offering a good selection of routes, including what must be the thinnest V.Diff anywhere (10 degrees steeper and it would be more like HVS). The light was turning golden, autumn suggesting itself timidly, before we headed reluctantly homeward, happy with the weekend’s work. Delayed by two weeks due to organiser holidays, this proved to be one of the most productive working weekends in spite of a poor (wrong) weather forecast. Saturday dawned to dry and better weather than predicted so an early start was made preparing and painting the outside of the hut. With so many helpers, the work was done by 2 pm allowing a well-earned walk up Causey Pike for Ken Fyles, Dave Archer, Helder Machado, Ken Hollis and new starter Ewan Ritchie. Helder securing the panels in place. Again on the Sunday, the weather was kind allowing us to fix new solar panels on the roof of the main hut to help charge the battery operating the fridge. Putting up new solar panels on the main hut roof is always a logistical nightmare as the panels are heavy and the roof is slippery. The problem was solved by hauling the solar panel to the roof apex by rope whilst a second rope secured Helder Machado to secure the location of the panel. Dave Archer made the electrical connections and reported an output of 3 amps, quite good in hazy sunshine. Meanwhile Neil McGovern and children Ben and Ella were busy clearing rubbish from the site into Neil's trailer. Very little Kingspan off-cuts now remain and will be cleared in future visits before Christmas. 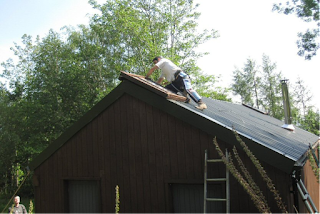 Other small jobs completed were: a lock for the toilet door, painting the white window frames of the hut, painting the brown toilet window frame, repairing a small leak in the annex roof and general clean up. A big THANK YOU to all those who took part.